A clay tablet discovered Greece changes what is known about the origins of literacy in the western world, obviously a good thing, and, unfortunately, also about the origins of bureaucracy. 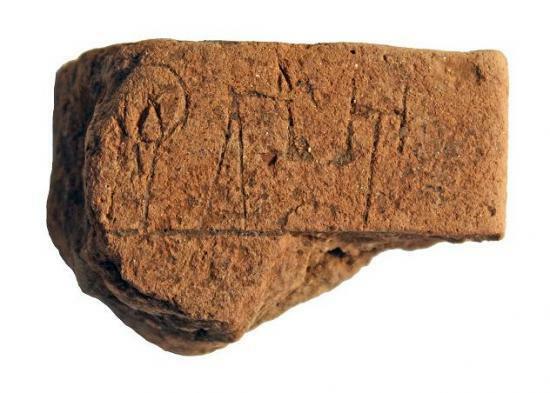 Measuring 2 inches by 3 inches, the tablet fragment is the earliest known written record in Europe, dating back to between 1450 and 1350 B.C., 100-150 years before the tablets from the Petsas House at Mycenae. The tablet was unearthed last summer during the excavation at the site in Iklaina, which sits in the middle of an olive grove in southwest Greece. Iklaina dates to the Mycenaean period (ca. 1500-1100 B.C. ), an era famous for such mythical sagas as the Trojan War. It was one of the capital cities of famed King Nestor, who figures prominently in Homer’s “Iliad.” Iklaina is the rare care where archeology meets mythology. The Mycenaeans used clay tablets in their palaces to record state property and transactions. These tablets are written in the Linear B system of writing, which is older than the alphabet. It consists of around 87 syllabic signs. These signifying signs stand for objects or commodities and the tablets are mostly lists of property and accounting records. Archaeologists are still studying the Iklaina tablet, but preliminary analysis suggests it may refer to some sort of manufacturing process. “On the front there is a verb that relates to some sort of manufacturing,” said Michael Cosmopoulos, director of the Iklaina Archaeological Project and the Hellenic Government Karakas Family Endowed Professor of Greek Studies at University of Missouri–St. Louis. “On the backside, there is a list of men’s names alongside numbers." Tablets like this one were not meant to be kept more than a year and as a result were never sent to a kiln, he said. They are preserved only if accidentally burned, which is the case of the Iklaina tablet. These pieces are indicative of a major center, potentially an early Mycenaean state capital. Cosmopoulos is cautious, however, and said that it is too soon to tell whether Iklaina was one or not. Currently, there is only a handful of known major state capitals, such as Pylos and Mycenae. Each summer Cosmopoulos returns to the dig site with a team of about 40-60 students and 25-30 staff and specialists. The land of the excavation was purchased on behalf of the Greek government, and by law all the finds remain in the local museum as property of the Greek state. The dig is funded with grants from the National Endowment for the Humanities, the National Geographic Society, the Institute for Aegean Prehistory, Harvard University, the Pylos Archaeology Foundation, and the Center for International Studies at UMSL.